Wren House - Recycled Cedar, comes with "S" hook to hang. Clean out by removing back panel. 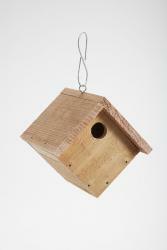 Buy Wren House and Chickadee House,Chickadee Box Kit 104.